That last bastion of sanity on the internets, Archive.org, hosts a copy of John Gerard’s 16th century bestselling foraging manual, The Herball, or, Generall Historie of Plantes. I’ve embeddified it as an alternative to spending an evening staring at the Netflix browse menu or as an opportunity for workplace dinkering. Gerard was superintendent of the gardens of William Cecil, advisor to Queen Elizabeth. 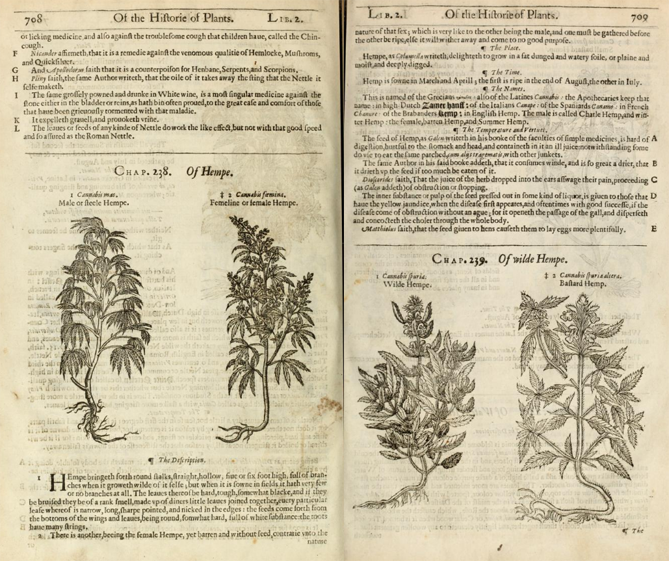 Gerard was one of the most respected plant experts of his time, but, strangely, he was not the primary author of the famous herbal that bears his name. Except for the additions of several plants from his own garden and from North America, Gerard’s herbal is simply an English translation of Dutch scholar Rembert Dodoen’s highly popular herbal of 1554. I appreciate Gerard’s (Dodoen’s?) Herbal for two reasons, first the beautiful illustrations but principally for one word that Gerard uses. Where a modern plant guide would have a section devoted to the “uses” of a particular plant, Gerard uses the word “virtue” instead. I propose a revival of this word when we speak of plants. “Use,” like so many other things in our culture, is far too utilitarian. Speaking of the “uses” of plants reminds me of a professor in my music department who, when arriving at a party, asked the department secretary, “who’s the most powerful person in this room?” so that he would not have to “waste” his time with simply enjoying the company of other people. Speaking of the “virtues” of plants seems much more civilized. After seven years our two cats have finally discovered that they can jump on the kitchen counters. They made this unfortunate discovery just as Kelly and I were preparing food for a dinner party. Kelly chopped some cheese and went to take care of something in another room. When I stepped into the kitchen one of our cats, Buck, was up on the counter and happily noshing down on that cheese. Few things in nature are as deliberative as a cat making a call on jumping. The assault on our kitchen counters actually came in two parts, somewhat like finding an alternate route up Mt. Everest. The first step came two weeks ago when the cats figured out they could jump on the counter adjacent to the stove. From there they must have spotted the other counter and a week later made the dinner party assault on cheese summit. Perhaps someone will come up with a cat jump rating similar to the climbing grades used by mountaineers? 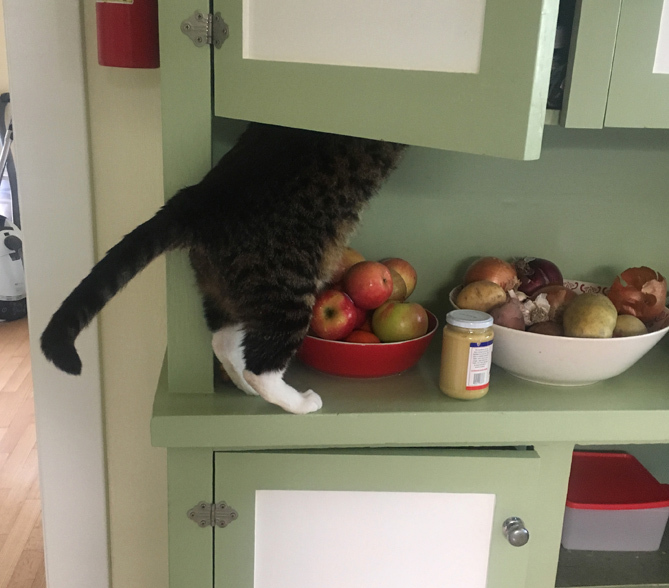 In a parallel cognitive leap, the cats also figured out how to explore the cabinets and remove lids from Tupperware containers. Looks like we’re going to have to give up cooking and eat all our meals out. Team Human. 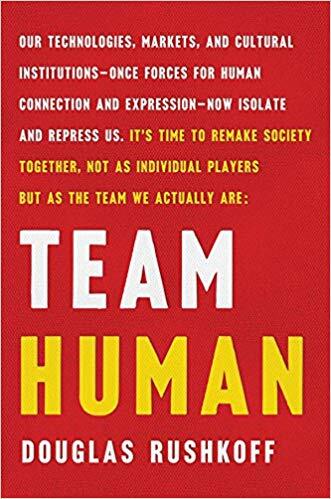 Team Human is a manifesto―a fiery distillation of preeminent digital theorist Douglas Rushkoff’s most urgent thoughts on civilization and human nature. 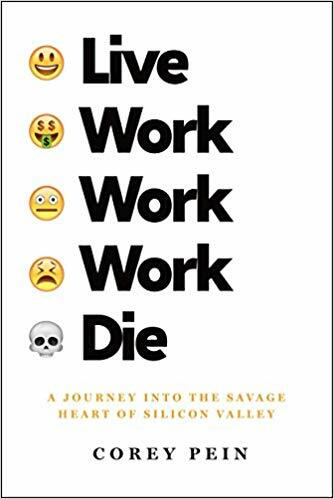 In one hundred lean and incisive statements, he argues that we are essentially social creatures, and that we achieve our greatest aspirations when we work together―not as individuals. 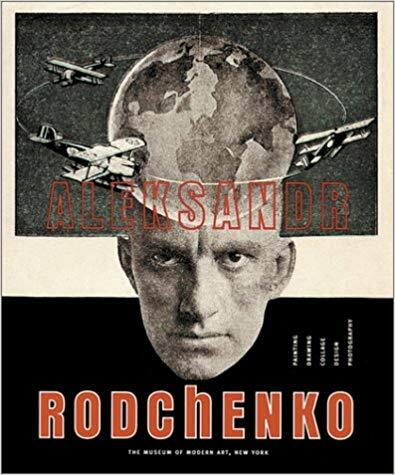 Yet today society is threatened by a vast antihuman infrastructure that undermines our ability to connect. 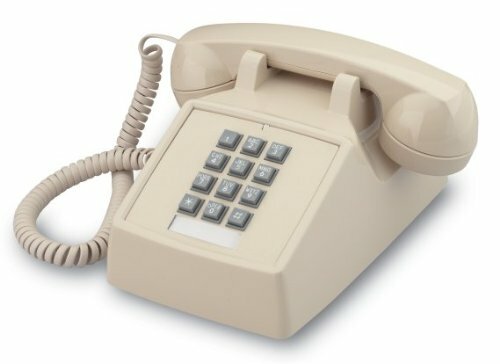 Money, once a means of exchange, is now a means of exploitation; education, conceived as way to elevate the working class, has become another assembly line; and the internet has only further divided us into increasingly atomized and radicalized groups. 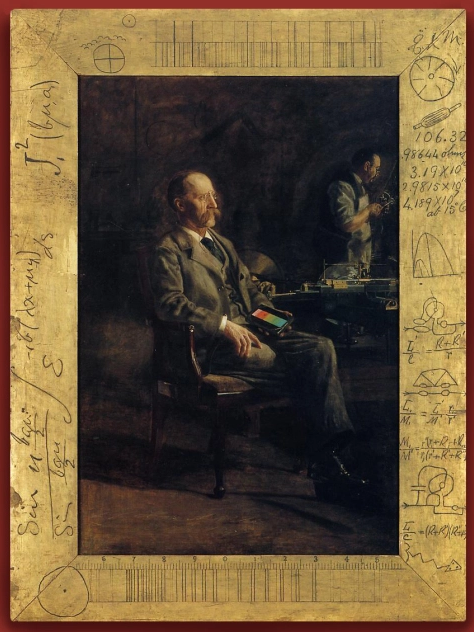 Thomas Eakins (1844-1916), Professor Henry Rowland, 1897. I remember going on a tour of an art museum once when, towards the end of the tour, the docent asked if anyone had any questions. One of the people on the tour, motioned towards the ornate gilded frames and asked about where they came from. The docent grimaced and I could tell that she thought this was a stupid question. 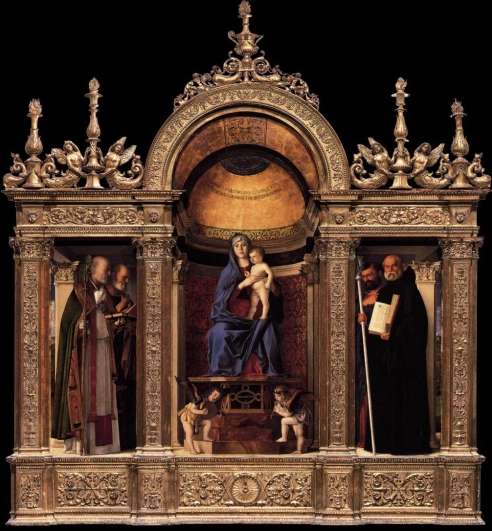 Giovanni Bellini, the Frari Triptych, 1488. It’s not. It turns out that most artists of the past gave a lot of thought to the frames, often coming up with their own designs or collaborating with highly specialized woodworkers. I know about this though my discovery of a deliriously detailed and meticulously researched jewel of the internet: The Frame Blog. The blog is run by frame historian, Lynn Roberts and has over 45 contributors. Don’t believe how important frames are? Just look at this post to see what happens when the frames go missing. And Roberts also likes to point out how important it is to include the frames when paintings are reproduced online or in books. To go meta on this, the post-modernist in me thinks it’s important to look at the frames we put around everything, not just art. And, practically, I’ve been trying to make some of my own frames lately with a table saw jig and Frame Blog has been a source of inspiration (and humility as my frames look like they were made by Fred Flintstone by comparison). The Frame Blog is one of the few gilded nodes on the internet’s tarnished tubes. 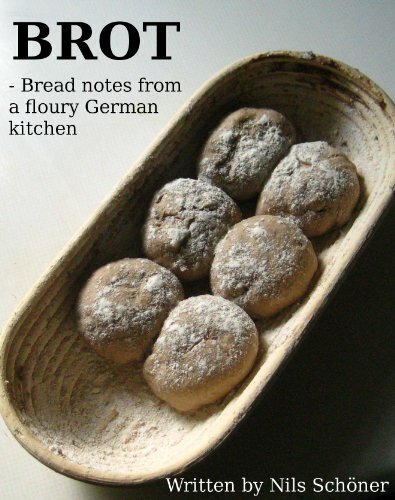 Brot: Bread Notes From A Floury German Kitchen was compiled from the notes spanning more than three years of extensive testing, baking and tasting, carried out by Nils Schöner in a kitchen in Germany. The quest for baking the best possible bread has resulted in 52 formulas for making anything from yeasted to sourdough breads like the rustic German Vollkornbrot to sweet pastries. Each recipe has at least one corresponding photograph that illustrates the desired result. Plus, a chapter on baking tips and how to get the best results in a home oven helps you through the process.